Important note: The FAQs below are not a comprehensive resource, and only address a fraction of the available capabilities in IRI software or questions people ask. Please visit the IRI solutions and products sections to learn more. Also, do not hesitate to contact us if you have any questions, or need details on specific features or options applicable to your use case(s). What kinds of analytics can Voracity perform? 1) Embedded reporting and analysis - via CoSort SortCL programs that write custom detail, summary, and trend reports in 2D formats complete with cross-calculation, and other incorporated data transformation, remapping, masking and formatting features. The reports can be descriptive, or through more fuzzy logic and functions like standard deviation -- and Boost-driven statistical and BIRT-driven linear regression graphs -- predictive. 3) Data preparation (franchising) that accelerates time-to-visualization for 10 third-party BI and analytic vendor platforms. This section of the IRI blog site features benchmarks run when SortCL (available to Voracity or CoSort users) alone runs ahead of BOBJ, Cognos, Microstrategy, QlikView, Splunk, Spotfire, R, and Tableau. 4) There is also a direct Voracity add-on for Splunk to feed data to Splunk for analysis there. 5) Integration with a cloud dashboard from DWDigest for interactive business intelligence you can customize and view in any browser, including the internal web browser in the IRI Workbench GUI for Voracity, built on Eclipse. 6) Streaming anlalytics (pending) through JupiterOne, where Voracity can be a source of Kafka-fed data streams, or a target for further procressing of live sentiment analysis data. 7) Colocation and integration with the KNIME Analytic Platform in the IRI Workbench IDE for Voracity, built on Eclipse, to allow citizen data scients to punch above their weight with machine learning, artificial intelligence, neural networks, unstructured data, and other advanced data mining nodes and projects. Is CoSort a BI tool? It can be. CoSort offers a range of solutions for generating meaningful reports from huge volumes of data. You can use CoSort's SortCL (4GL) program as a standalone report generator, or as a staging tool to digest and hand-off large volumes of data. Not only does SortCL transform and protect huge volumes of disparate data from a variety of RDBMS sources, and sequential or index files, plus web and various device logs (including ASN.1 TAP3 CDRs). It can also join, aggregate, calculate, and display that data in custom detail and summary report formats, complete with special variables and tags for web pages. Which third-party BI/analytic platforms does CoSort (or Voracity) optimize? IRI software's job in these cases is to prepare or "wrangle" big, structured data in a centralized place. CoSort or Voracity users create Sort Control Language (SortCL) programs in 4GL text scripts -- or through wizards in the free IRI Workbench GUI, built on Eclipse™ -- that transform (filter, sort, join, aggregate, mask/encrypt, pivot, pre-calc, etc.) data in more than 125 sources prior to the hand-off. 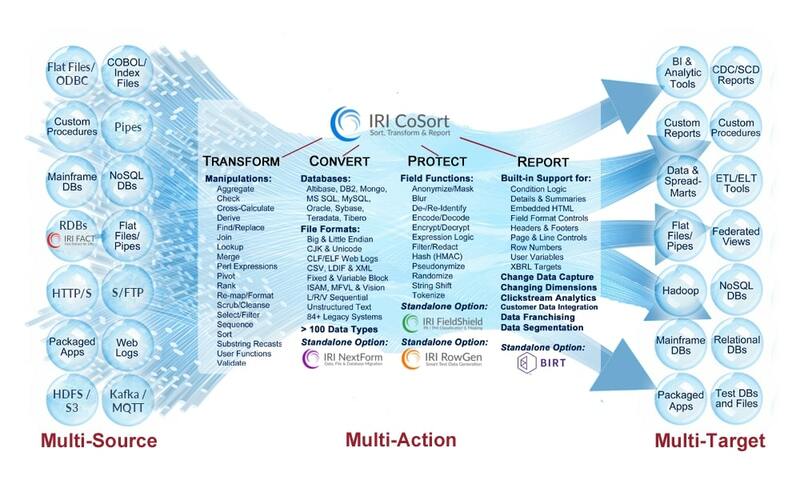 In addition, ODA driver support in the IRI Workbench provides seamless data and metadata flows between CoSort/SortCL data preparation and BIRT presentation. There is also a Splunk Add-on for Voracity, plus support for the DWDigest cloud dashboard app from NextCoder, and upcoming Voracity feeds through Kafka to streaming analytic platforms like JupiterOne and integration with the KNIME Analytic Platform in the same pane of glass. Can roles be used to segregate administrative functions like managing data or metadata access rules, or managing role memberships. How about access to activity log data for auditing and reporting? ActiveDirectory or LDAP (O/S)- and/or repository (e.g., Git)-controlled access to data files, workspaces, projects, data and job metadata, executables, logs, etc. In the context of IRI Chakra Max (DB firewall) administration, access to the database, unmasked query results, monitored function, and audit logs/reports are controlled through highly granular access policies with defined individuals and group roles. Can users be assigned multiple roles? Yes, Multiple roles/permissions for IRI FieldShield or Voracity (etc.) metadata assets (ddf, job scripts, flows) etc. can be assigned through system administators assigning policy-driven ActiveDirectory or LDAP objects to those assets. Other options include the AnalytiX DS data governance platform (premium option) or Eclipse code control hubs like Git; see http://www.iri.com/blog/iri/iri-workbench/introduction-metadata-management-hub/​ for an example. The IRI Chakra Max (DB firewall) manager program supports the designation and deletion of Administrator, Viewer, and Manager roles. The highest level administrator can also delegate security policy approval permissions to other administrators. Such role permissions are set at very fine-grained individual or group levels controlling DB log-in, execution authority, data access, and audit log query/report/restore privileges. Can you define different roles for different data sources? How about different access rights based on those roles? Yes, In the context of IRI Voracity (for profiling, ETL, DQ, MDM, BI, etc. 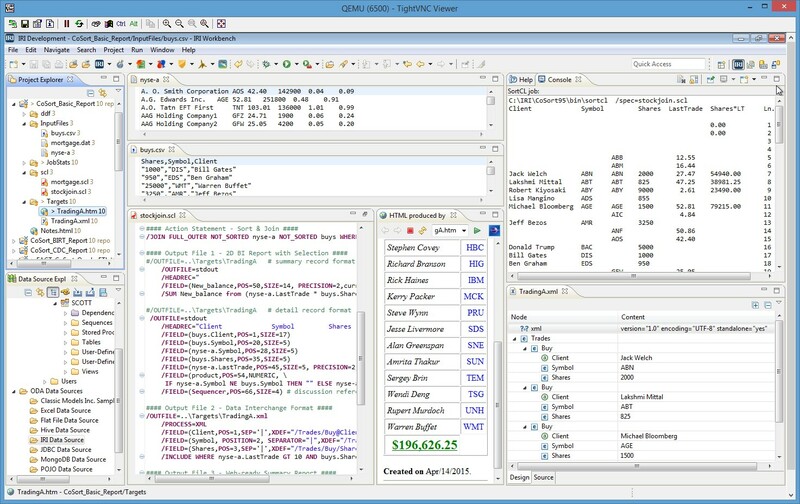 ), CoSort (for data transformation), FieldShield (for PII discovery and masking) , NextForm (for data migration, remappping and replication), and RowGen (for TDM and subsetting), access to specific data source (and targets, down to the column level) can be controlled through DBA-granted or file-level permissions (managed in DSN files and the IRI Workbench data connection registry), as well as through field-level revelation authorizations controlled in (securable) job scripts and decryption keys. In the context of IRI Chakra Max (for DB DAM/DAP and DDM), individual and group roles can be matched to granually-defined security policies that will determine the right to connect to specific DB instances, execute certain SQL statements, have columns dynamically masked (or not), etc. Does IRI software support RBAC? Yes, in multiple ways, including access permissions to job metadata, data sources (and targets), and decryption keys, and via differential data class function/rule assignments. See the other questions in this section and contact fieldshield@iri.com or voracity@iri.com for assistance setting up your controls. Does Voracity (FieldShield, or other IRI software) independently check who the end-user is attempting to access protected data, or does it rely on the underlying database or application access controls? Both, inasmuch as data, metadata, and/or job script access -- plus execution permission -- are associated with ActiveDirectory object-defined, DBA login, and/or file-system controls imposed on a policy basis for authentication purposes. IRI also offers optional DAM/DAP technology (Chakra Max), a market-leading database firewall system that also dynamically masks queried data pursuant to specific policies affecting individual users, user roles, or user groups. Calling applications can also impose additional layers of user authentication to optionally fill a gap or protect additional data touchpoints. How do you control access to the product based on roles? 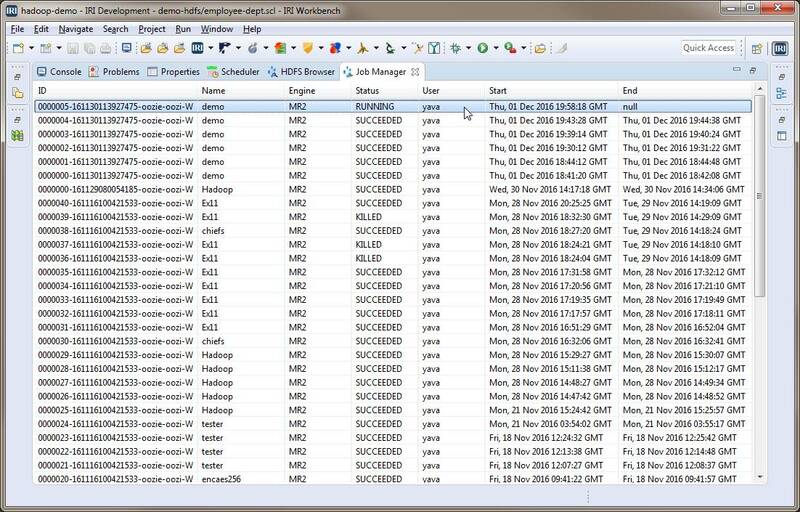 Through client computer or ActiveDirectory/LDAP imposed access controls and file-level permissions. Beyond that, either the AnalytiX DS governance platform or any Eclipse-compatible SCCS like Git for metadata assets -- where permissions by role are configurable -- can lock down specific projects, jobs, and other metadata assets. Access to the IRI Chakra Max database firewall product however is controlled by sign-ons to the manager and user (client) modules. Voracity is a modern one-stop-shop for rapidly managing and leveraging enterprise data. It is also a standalone ETL and data life cycle management platform product that also packages, protects, and provisions all forms of "big data." Voracity saves money on software, hardware and consulting resources, while expanding your enterprise information management (EIM) capabilities in support of digital business initiatives -- all from one Eclipse pane of glass. All the features/functions listed below are supported in the IRI Voracity data management platform and constituent IRI Data Manager and IRI Data Protector suite products (excpect FACT and Chakra Max, respectively). Refer to the Components here. GUI refers to the IRI Workbench Graphical User Interface. 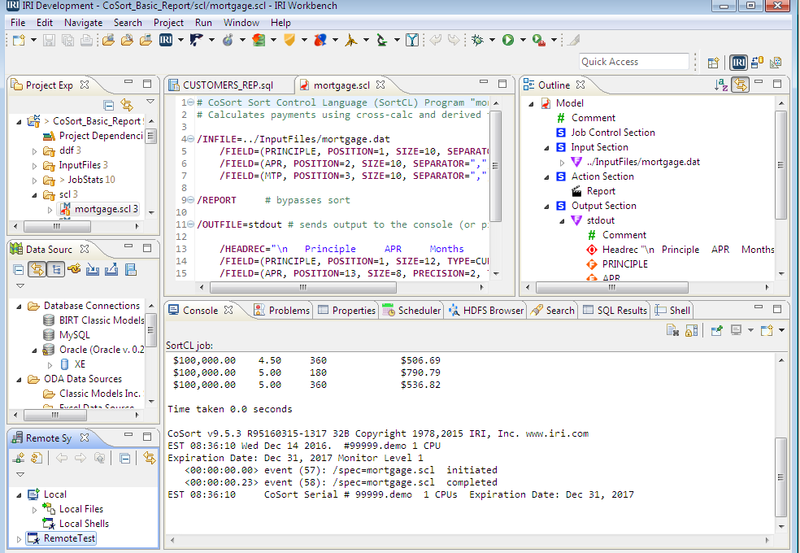 IRI Workbench is a free Integrated Development Environment (IDE), built on Eclipse,™ for integrating and transforming data with the SortCL program in Voracity, IRI CoSort, and all other IRI software. 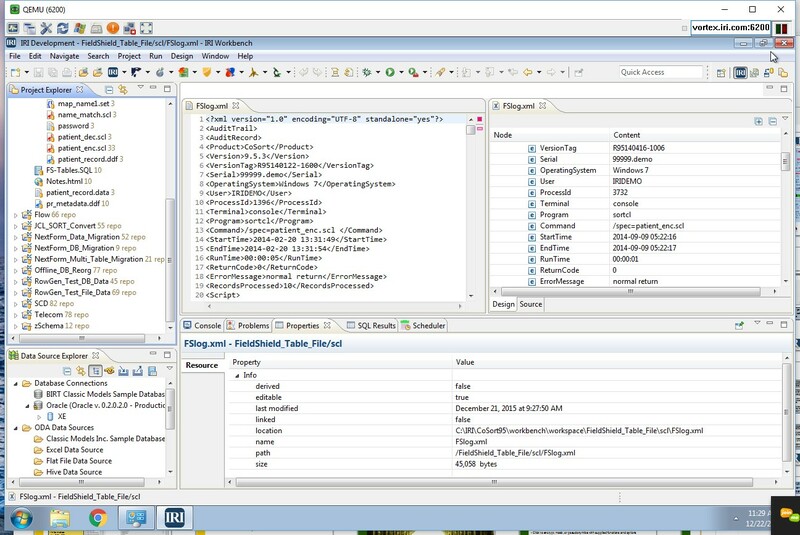 DTP refers to the Data Tools Plugin (and Data Source Explorer) in the IRI Workbench. DDF refers to Data Definition Files, the metadata for source and target data layouts. We already spent a fortune on our ETL tool. Can you just help use run its jobs faster? Run "SortCL" program jobs in the IRI CoSort package or IRI Voracity platform from your tool's command-line (shell) option to prepare big data faster, and populate the DB tables or file formats your tool can directly ingest. Use the same high-performance data movement engines that Voracity can: IRI FACT for extraction, IRI CoSort (or Hadoop) for data transformation, IRI NextForm for data/DB migration and replication, IRI FieldShield for data masking, and/or IRI RowGen for generating test data. Can we replace our legacy ETL tool automatically? Yes, now you can. Voracity is API-integrated with AnalytiX DS metadata hub technology so you can convert from legacy ETL products more or less automatically and affordably. Contact your IRI or AnalytiX DS representative and ask about CatFX templates for Voracity from your current ETL tool, along with any LiteSpeed Conversion services you need to help port and test the more complex mappings. Whether you are switching ETL platforms or just starting out in data integration, use Voracity to shrink time to deployment and information delivery. Why should I consider IRI Voracity? What does Voracity offer that others don't? Raw power and scalability with or without Hadoop; i.e., built-in performance in volume, but also seamless support for Hadoop! Multiple nested layers for both conditions and derived fields with support for PCREs, fuzzy matching, C (math/trig) functions, locale and 'conversion specifiers', etc. separate data masking tools includes every single function in FieldShield, the most robust data masking and encryption tool available. Is CoSort an ETL tool? In Voracity, much of the above is exposed in graphical wizards, specification dialogs, workflow and transform mapping diagrams so you don't need to learn how to script those jobs. The jobs can be previewed and then run (scheduled) from the GUI, or on the command line (and thus in batch scripts and other applications, as well as third-party ETL tools that need a boost). Metadata can be change-tracked, shared, secured, and version-controlled in repositories like EGit on-premise or in the cloud. Does CoSort work with other ETL tools or tasks? Yes, both. As far back as 1999, industry experts have been touting CoSort as an ETL engine for its high-performance data staging and integration capabilities. CoSort - and it's SortCL program in particular - performs the heavy lifting of selection, transformation, reporting, and pre-load sorting against sequential files in an ODS, DW staging area, or on extracted tables in suspense. CoSort's SortCL is a push-down optimization option for Informatica PowerCenter, and in the sequential file stage of IBM DataStage, to perform faster, combined (single-pass) sort, join, and aggregation operations. Click here to read the press release about CoSort's 6x improvement of Informatica speed. Besides proven integrations with, and plug 'n play sort replacements for, DataStage and Informatica, CoSort also links to Kalido, ETI, SAS and TeraStream ETL packages. CoSort's SortCL programs can be called as an executable from any tool allowing that as well, which would also mean Ab Initio, Pentaho, JasperETL, Pervasive DataRush, Hummingbird, and others, to further consolidate and optimize data transformation performance via the file system. Can we use CoSort or Voracity with DataStage? Yes. Either through the DataStage sequential file stage or Before-Job Subroutine. With or without the larger Voracity ETL and data management platform subscription supporting CoSort, you would use CoSort as an external data transformation hub, combining large sort, join, aggregate, reformatting, protection, and cleansing functions in a single job script and I/O pass in the file system. Voracity adds the visual ETL design environment and Hadoop execution options around CoSort. Can we use CoSort or Voracity with Informatica? Yes. With or without the larger IRI Voracity ETL and data management platform subscription supporting IRI CoSort, you can use CoSort as an external data transformation hub, combining large sort, join, aggregate, reformatting, protection, and cleansing functions in a single job script and I/O pass in the file system, and just call those jobs into existing Informatica job flows as a command line operation. Voracity adds the visual ETL design environment and Hadoop execution options around CoSort. We have hundreds of tables and files, and thousands of fields already defined for processing in our ETL tool(s). How can we exploit CoSort / Voracity on our flat files or other sources and leverage existing field layouts (i.e. not re-define them manually)? 1) AnalytiX DS Mapping Manager or LiteSpeed Conversion processes migrate legacy ETL jobs to equivalent Voracity ETL jobs. Voracity ETL jobs are powered by the CoSort SortCL program or interchangeable Hadoop engines mapped the same way. This includes both source and target data layout specifications, and most transform mappings. Manual translation and testing services fill in the gaps for complex mappings that do not auto-convert. 2) For only converting the data layouts in another ETl (BI, modeling, and DB) tool to SortCL layouts, you could also use the Meta Integration Model Bridge (MIMB) to convert Informatica .xml, DataStage .DSX and other third-party tool metadata to CoSort SortCL DDF. We use CoSort already, so don't we already have Voracity? Voracity's core data manipulation features -- transformation, mapping, masking, and embedded report formatting -- are all built into the SortCL program you can already script and run with your CoSort license to do those things. And, the GUI for CoSort (IRI Workbench, built on Eclipse), is the same GUI Voracity and all subset IRI products in the IRI Data Manager (CoSort, FACT, NextForm) and IRI Data Protector (FieldShield, CellShield EE, RowGen) suites use! With that GUI comes access to a lot of Voracity features through the toolbar menu, like data discovery, ETL flow diagrams, MDM wizards, FieldShield data masking and RowGen test data generation wizards. So you could run a lot of those jobs with your existing SortCL license. As a CoSort licensee, however, you are only entitled to IRI support for the feature-functions documented in the CoSort manual (and in particular, the SortCL language reference chapter), and for GUI operations based on jobs created from wizards in the "CoSort" (stopwatch icon) and "IRI" menus in the IRI Workbench toolbar. That is, you would normally be confined to the materials for CoSort users in the Welcome section and support content for CoSort in the help menu. Voracity subscribers, on the other hand, are entitled to support from IRI for all the feature-functions and menu items exposed in the IRI Workbench GUI, including data profiling, masking, test data, ETL, MDM, CDC, slowly changing dimensions, metadata management, and BIRT integration. Voracity users can also get IRI support on optional upgrades with Voracity-compatible software like AnalytIX DS Mapping Manager, IRI FACT, running SortCL jobs in Hadoop, predictive analytic reports using SortCL and BIRT, and the Paques self-service, shard-powered BI module. For a complete list of the available features and support provided with all IRI software, please refer to this comparison page. CoSort's SortCL program has built-in filtering and selection logic to reduce bulk, segment, and scrub data during or after processing. For more advanced data cleansing and quality operations, SortCL allows you to plug in your own function libraries to perform custom transformations at the field level, before or after sort, join, merge, or report processing. SortCL ships with a sample template: a Melissa Data address standardization object that cleanses the address field as records are output. Are you CoSort or are you IRI? The company is IRI, Inc. IRI stands for Innovative Routines International. IRI was founded in New York in 1978 as Information Resources, Inc. and changed its name during the relocation to Florida in 1995 (where the name Information Resources was already in use in Florida). CoSort is IRI's first product and IRI is well known for it. See the products and company sections of this web site for more information on both. We are not affiliated with another IRI -- the Chicago firm best known for retail market research called Information Resources, Inc., but ironically, they are an IRI CoSort licensee of record. How do SortCL, CoSort, the IRI Workbench, and Voracity interrelate? CoSort is IRI's best known software product for data management and manipulation. The primary operational facility and user interface in the CoSort package is the Sort Control Language (SortCL) program. SortCL refers to both the executable and the 4GL syntax for job scripts that contain both data definition and manipulation statements. The SortCL program has given rise to several IRI spin-off products that use the same syntax for data definition, but support a lower-cost, targeted functional subset of manipulation commands. Such SortCL-compatible, fit-for-purpose IRI products include: NextForm for data migration, FieldShield for sensitive data masking, and RowGen for test data generation. Voracity is IRI's new, "total data management" platform that includes CoSort and all the SortCL spin-off product capabilities, as well as new data discovery (profiling) tools, visual job design features for DW/BI architects, DBAs and business users, plus: Hadoop engine options, cloud and big data connectors, and data quality and MDM wizards, and multiple analytic frameworks. IRI Workbench is the free, common Eclipse GUI for designing, deploying, and managing all SortCL-compatbile software jobs as well as all the additional functions of Voracity above. IRI does a lot, and has been around a long time. But I've never heard of you. Why? Until recently, IRI's primary focus and product line has served back-end systems that not many talk about. Doing the heavy lifting for other people's products and operations (including Accenture, CGI, Cincom, Dell, Epsilon, Sabre, Sungard, and Unicon) has made IRI more of a silent partner than the total solution provider that the company's software stack proves it to be. In actuality, IRI is also a prominent enterprise software vendor and well known to many large companies worldwide (like American Airlines, Bank of America, Comcast, Disney, EDS, and Fidelity Investments), as well as the consultancies that serve them. Both customers and analysts following IRI note that the company is not venture-backed and invests far more in R&D than it does in marketing, providing far more value to customers. Gartner is following IRI software in their data integration, data masking, legacy migration, test data, and business intelligence research. IRI is also gaining recognition in the areas of big data (with and without Hadoop), data security, analytics, quality, metadata management, master data management, and unstructured data. Is evaluation free? Will you help me if it is? How do I get help with PoCs and implementation? From IRI's support staff, its international representatives, and expert independent consultants. Call or email us before, during, or after your evaluation to get directed to the right resource. Because it is in IRI's best interests for your business and technical goals to be met through the use of IRI software, we will collaborate with you in the development and maintenance of successful solutions. I don't know your products. Who will support me? We will. So will more than 40 international support offices. And there are many third-party consultancies familiar with IRI software who can help you implement, optimize, and support applications around the tools. More importantly, you will find it surprisingly easy to support yourself. One of the most compelling aspects of IRI software is its simplicity. All the data and job-related metadata are shared, exposed, self-documenting, and easy to modify and extend. There is also a familiar Eclipse GUI automating script creation, integration, execution, and management. Why do IRI's prices seems lower than competitors with similar capabilities? Because they are lower. See the answer to the question above about why IRI is not better known in certain circles. Being part of so many other applications has not required the marketing overhead of our competitors. IRI has also chosen not to be a public company, and has not been servicing external investors or debt. Our customers continue to benefit from these savings. How do I buy your product(s)? Directly from IRI or through an approved IRI VAR outside the Untied States who can also service our software. Call or email us for a price quote -- or use this form -- and specify the the product(s) you want to license after successful evaluation. Prices are based on what and where you run (see the pricing FAQ). IRI accepts purchase orders and credit cards. Is 24/7 support available? Do you charge more for it? Yes, it is available. There is normally an upcharge to standard annual support to provide 24/7 support worldwide. What is your maintenance and upgrade policy? Are updates included? Maintenance is free in the first year after licensing. For those users covered under maintenance, minor new releases are provided free upon request or if needed for support. Major new releases are also optional, but usually chargeable upgrades. The cost of the upgrades depends on your maintenance level. How do I make sure my costs won't go up later? Because you are buying a perpetual-use license, once. Support is optional and you are not forced to upgrade (even though you should eventually). If you are using Voracity on a subscription basis, however, you can lock in the license and support cost for five years through a discounted up-front payment. How do I know the process status during execution? If you are executing Voracity jobs in Windows, Linux, or other Unix file system using the default CoSort/SortCL (or subset) program, that executable can send event (job status) messages to the (CLI or GUI) console at various verbosity level (most basic shown below). What are the recovery mechanisms available? We believe that Hadoop provides for this automatically. Default CoSort/SortCL-based executions only allow for pause/resume in the event of insufficient soft overflow (temp) file space. What kind of audit data and dev ops data can be available from job execution? CoSort is a robust, commercial-grade software package for efficiently manipulating and managing high volumes of data. More specifically, it is a sorting, data transformation, migration and reporting package that addresses a very wide range of enterprise and development-related challenges in data integration, data masking, business intelligence, and ancillary disciplines. Please review the product description and solution sections of this web site for details. How fast can CoSort run? Very. Performance varies by source sizes and formats, data and job orientation, hardware configuration and resource allocation, concurrent activity and application tuning. The best benchmarks (e.g. 1GB in 12 seconds, 50GB in 2 minutes) run in memory on fast, multiple CPU Unix servers. At what data volume would I need CoSort? Are there limits to how much data or how many files CoSort can process? When you perceive a bottleneck, which could be starting at 500K to 50M rows depending on your hardware. CoSort sorts routinely in the terabyte range -- and scales linearly in volume without Hadoop. Input files in the dozens or hundreds of gigabytes are now common. Any number of input and output files -- and structured file formats -- are simultaneously supported, including line, record and variable sequential, blocked, CSV, I-SAM, LDIF, XML (flat), and Vision. For a list of supported data sources, click here. CoSort is now also the default engine in the IRI Voracity ETL, BI/analytic data preparation, and data management platform which can also run many CoSort data transformation and masking jobs (scripted in SortCL 4GL syntax and/or represented graphically in the IRI Workbench GUI) seamlessly in Hadoop. Thus the question may be at what volume point would I need to run such jobs via a Hadoop engine instead. See our article, When to Use Hadoop. How would I tune CoSort? What would I tune? Usually through a CoSort Resource Control (cosortrc) text file, which can be global, user, and/or job-specific. On Windows, default registry settings also set up at installation time and can be overridden by an rc file. You can specify a ceiling and floor on CPU/core threads and memory, I/O buffers, and allocate/compress disk space for sort overflow. There are several other documented job controls also specified at setup, and easily modified (or secured) later. How do we determine the best number of cores to use / threads to license? Request a license key through the normal CoSort installation and registration process (as instructed in the install guide) for a temporary period. Be sure to specify the total number of physical cores on the machine in your RegForm.txt file. Then once you get the license keys to allow that number (up to 64), run jobs with different THREAD_MAX values (from 1 to the max) in your cosortrc file. You can also experiment with memory and overflow-related settings to see what works best. Please advise support@iri.com if you need more details, and consult Section D. of the appendix chapter of the CoSort manual for technical specifics, and a way to automate the benchmarking process. Remember that your runtime results are logged so you can analyze performance off line later. What about monitoring and logging (statistics)? What data types does CoSort support? More than 120 now, and counting. These includes single and multi-byte character sets, Unicode, C, COBOL, and mainframe numerics. Contact IRI to help obtain a definition if you are not sure what you have. Moreover, CoSort supports the (simultaneous) collation, conversion, and creation of more than two dozen file formats. How do I suppress $SORTIN/OUT lines when converting MVS sort parms to CoSort SortCL scripts? This is fine, except that I don’t want the lines that have $SORTIN or $SORTOUT. How can I suppress these lines? A. There are no specific mvs2scl options that will do this. But there are options with the grep command that can be used while executing the translation. Here is what you should execute on the command line. How and where does your SAS sort replacement work? SAS documents the CoSort option in the v7 and 8 system for Unix, which is reflected in the SAS and CoSort user manuals. For SAS 9, contact SAS, as they have to update the appendage for CoSort and have not yet done so. IRI has made repeated requests for SAS to update their CoSort connection. SAS is now requiring that you make your request known directly to them and IRI at the same time. Thank you for helping us help you and others who need this interface. The same goes for Windows. Once installed, CoSort performance is tuned automatically, as well as through a resource control file that is configured at set up time by the system administrator. This text file can be modified at any time for reference at a global, user or job level. How do these plug-ins or conversion tools work? They differ, and are based on collaboration and feedback with partners and customers who own their data and job definition metadata. Can I apply data masking functions to BI/DW tasks or tools? Yes, simultaneously. In fact, the IRI CoSort product (via its SortCL program) or the IRI Voracity (big) data management platform (via SortCL or interchangeble Hadoop engines) can enforce field-level security in the course of data integration, data quality, and reporting jobs. In other words, you can in the same product, program, and I/O pass: mask/redact, encrypt, psedonymize or otherwise de-identify PII values while transforming, cleansing, and otherwise remapping and reformatting the data from heterogeneous data sources. Legacy ETL and BI tools cannot do this as efficiently or as affordably. In fact in Voracity -- which supports and consolidates data discovery, integration, migration, governance, and analytics -- you can process (integrate, cleanse, etc. ), protect (mask), and present (report/analyze) or prepare (blend/munge/wrangle) data all at once. keep both protected and unprotected data available to the routines and systems that need to access it. Can you protect only flat-file fields, or database columns, or both? And why is your approach better than built-in database column encryption? Both! FieldShield and CoSort's SortCL program give you the ability to protect both kinds of data sources simultaneously with one or more field-level security functions. These IRI products can address either source type in bulk (static data masking) or surgically (dynamic data masking) through filter command or customized stored procedure calls. You may also need to leave your data as-is while it's in the database, but protect it while it's moving into or out of the database. That's where flat files come in. Data is often in a flat file format as it goes in or out of your databases. Other encryption products protect an entire file, database, disk, computer, or network to protect sensitive data moving through your systems. However, encrypting more than the fields that matter can take a long time, and cut off your access to the non-sensitive data that still needs to be accessed and processed. FieldShield and CoSort's SortCL can encrypt (or otherwise protect) only those fields/columns that need it, and can do it in the same job scripts and I/O passes with big data transformation, migration, and reporting. For CellShield, how do I know if I need the 32- or 64-bit version? It depends on the version of Excel (not your O/S) that is running. How can I tell whether I'm running a 32-bit or 64-bit version of Microsoft Office? Start a Microsoft Office program (Word, Excel, Outlook, etc.). Select Help in the left column (Or Account if you are using Office 2013 or newer. If using Outlook 2013, click Office Account). Review the version information (e.g., Microsoft® [Program Name]® (15.0.4771.1000) MSO (15.0.4771.1001) 32-bit) on top of the new window to determine whether you are using a 32- or 64-bit version. NOTE: You may not necessarily be using a 64-bit version of Microsoft Office even if you are using a 64-bit version of Windows XP, Vista or Windows 7-10. How robust is the encryption? FieldShield and CoSort ship with multiple 128 and 256-bit encryption libraries using proven, compliant 3DES, AES, GPG and OpenSSL algorithms. For each field, you can use the same or different built-in encryption routine, or link to your own encryption library and specify it as a custom, field-level transformation function in a job script. You can also use the same algorithm(s) and a different encryption key for each field as well. How would I use FieldShield or CoSort's SortCL tool to protect sensitive fields in my database tables, flat files, or 2D reports? I am looking for a way to make a copy of a production database for UAT that removes/randomizes sensitive values (not just hide them). Does FieldShield do that? Yes. You can also use FieldShield to remove (redact, omit, or delete), or randomize (random generation or value selection to replace) PII at the column or row level as options, instead of obfuscating it (via encryption or blurring, for example). The target of that job can be new tables with the same structure in another schema you can create, build, and load from IRI Workbench, which is as much a cross-platform DB administration environment as much as it is the IRI tooling environment. What about auditing these activities? All FieldShield and CoSort/SortCL job scripts and field-level functions can be recorded in XML audit logs that you can secure, and query with your preferred XML reporting tool. You can also use SortCL scripts (n.b. samples are provided, where /INFILE=$path/auditlog.xml /PROCESS=XML, etc.) against these audit logs for reporting. What data is transmitted via the CellShield plugin to external devices on the Internet, and if it is transmitted can you specify the data which is being transmitted? No data is transmitted from the CellShield plugin. And no connection is made or needed by CellShield or any other IRI PII discovery or static data masking product. Which protection techniques can I use? What should I use? IRI is happy to help you assess which functions best apply to your data. Note also that you can protect one or more fields with the same or different functions, or protect one or more records entirely ("wholerec"). In each case, the condition criteria and targets/layout parameters can also be customized, and combined with data transformation and reporting in the same job. And, in fit-for-purpose multi-table wizards, or through global data classification, DBAs and data stewards can apply these protections as rules to preserve consistency and referential integrity database or enterprise wide. What do practitioners say about this? "The first system for which the data warehouse is responsible is the data staging area, where production data from many sources is brought in, cleansed, conformed, combined, and ultimately delivered to the data warehouse presentation systems ... The two dominant data structures in the data staging area are the flat file and the entity/relationship schema, which are directly extracted or derived from the production systems." from "The Foundations for Modern Data Warehousing" by Ralph Kimball, appearing in Intelligent Enterprise Magazine's Data Warehouse Designer Section. Why does CoSort rely on flat files? Why should I? By using flat files, the SortCL program -- which is the primary utility in the IRI CoSort product and default engine of the IRI Voracity data management (and integration) platform -- bypasses the normal overhead of DB connectivity and transformations. SortCL even flattens FDB tables connected through ODBC and the data in semi-structured sources like MongoDB and JSON files. This helps move the engine through rows of data sequentially and consistently, while simultaneously exploiting the asynchronous I/O, advanced memeory management, and multiple-threads available from the O/S; i.e., it doesn't use Java programs, either. The flat structure it's processing also allows the tool to rapidly combine data transformation, reporting, protection and prototyping functions in the same job and I/O pass. Thus with SortCL, you can simultaneously filter, cleanse, standardize, transform, mask, and report on massive collections of data. Compare this kind of task consolidation potential with how you get work done now, particuarly against multi-step ETL tools which are not only inefficient by virtue of the multiple steps they have to configure, but also run, one memory-constrained, separate I/O step at a time, and sometimes also requiring partitioning with SortCL never would. Put another way, because of SortCL, if you use CoSort or Voracity or other SortCL-compatible products from IRI (like NextForm, FieldShield or RowGen), you can move through your data sources rapidly, and get a lot more done. So it's "one product, one place, one pass" vs. the complexity, cost and time it takes competing alternatives (multiple products, places, passes and prices). Why is this approach more cost-effective? Through it's Sort Control Language (SortCL) program, users of the IRI CoSort product or IRI Voracity platform can leverage the resources of their existing file systems to perform these kinds of jobs without the overhead and administrative constraints of databases and SQL procedures -- not to mention the cost of megavendor ETL tools and ELT appliances, in-memory DBs, or complex Apache projects. Data Transformation > select, sort, merge, join, aggregate, re-map, pivot, cross-calc, etc. So, to process, present, protect, and prototype big data, SortCL and flat files are still the fastest, and most cost-effective approach to consolidating information lifecycle management (ILM) activities. And if you keep your data in HDFS, many of the core data transformation, masking, and test data generation functions designed in SortCL can run in MapReduce 2, Spark, Spark Stream, Storm or Tez through Voracity's Hadoop gateway (called "VGrid") without re-coding anything! Can I speed unloads without FACT? Dumping the data to a flat file or pipe into CoSort without qualifiers encumbering the unload can help. So, save the order by, group by, distinct and join work for CoSort -- which can handle them all (at once) faster in the file system, and give you formatted reports in the same IO. How can CoSort improve my GROUP BY performance? CoSort's SortCL supports all SQL aggregate functions, including sum, average, count, maximum and minimum. But SortCL is more efficient in that it can sort on multiple keys and produce aggregate results for one or more output files in the same pass through the data, off-line. How can CoSort improve my JOIN performance? On an ia64 hp server rx5670 with four 1GHz Itanium2 CPUs and 32GB of RAM, Oracle 9i's SQL*Plus joined two 1G tables in 48 minutes. Unloading the same tables with the IRI Fast Extract (FACT) tool, piping these to flat stream sorts and joins in the CoSort SortCL program, and then piping the result into SQL*Loader built the same joined table in 18 minutes (or, ~1/3 the time of the on-line method). How can CoSort speed Oracle loads? Direct path, pre-sorted loads are the fastest way to build new tables since this loading method bypasses the overhead of Oracle's index sort. For bulk loads, CoSort the data first on the primary index key; the create index will bypass the sort step. For regular insertion loads, CoSort the data on the clustered index as the key. How does FACT improve extract performance? How would CoSort replace SQL procedures? CoSort (or Voracity) SortCL job scripts can do many of the same jobs much faster, and with far less coding. SortCL runs outside the database on flat file inputs, using the same relational logic and functions; i.e. SELECT WHERE, DISTINCT, ENCRYPT, ORDER BY, GROUP BY, JOIN. For example, CoSORT's SortCL uses conditional /INCLUDE and /OMIT statements to select from sequential input sources and output targets. DISTINCT is similar to /NODUPLICATES, ORDER BY is a /KEY, GROUP BY may be a /SUM, /AVERAGE, etc. We have hundreds of tables and thousands of columns defined in tables, though these are also represented as external files. How can we leverage SortCL without having to re-define these layouts by hand? Like FACT, both the AnalytiX DS Mapping Manager or Meta Integration Model Bridge (MIMB) from Meta Integration Technology, Inc. (MITI) can automatically convert the file layout metadata used in your relational or ETL tool into CoSort/SortCL data definition file (DDF) format. What do you mean by formatted reports? How much does the CoSort package cost? Per-copy prices, which include the SortCL program, typically range from the low 4 to 5 figures (USD) and are based on hardware (e.g. RAM, model number) and the number of cores in use. CoSort is also available by subscription within the IRI Voracity platform which does not take machine sizing into account. Contact your IRI representative for a cost estimate for your environment. In ithe perpetual use model, there are discounts for successive licenses ordered at the same time, limited or expiring usage, runtime integration, and GSA schedule procurements. Your company may also have an umbrella (site), or distribution (royalty) agreement in place with pre-negotiated discounts. Specific and final price quotes are provided under NDA. How are IRI's other offerings priced? IRI Workbench, the graphical IDE built on Eclipse, is currently free on Windows and Linux platforms. A MacOS version is also available on request and is free only to licensees of one of the products below. IRI Voracity is typically a subscription (one or five years) based only the total number of SortCL-executing hostname licenses, which are usually database or ETL servers. There are additional charges for Hadoop and other integrated (premium feature) options available through our partners. Perpeptual use pricing is also available on request. IRI FACT (VLDB unload) and IRI RowGen (test data generation) are priced per hostname according to the number of licensed CPU cores (threads) licensed for use on each. IRI NextForm has multiple editions and prices. See below. IRI FieldShield (static data masking) is based on the number of executing hostname licenses only, with higher costs on Linux and outside the US through IRI VARs. Runtime API calls to FieldShield SDK (dynamic data masking) functions are at various percentages of the full package price depending on volume. IRI CellShield and IRI DarkShield pricing is based on the number of spreadsheets / documents that need protecting. IRI Chakra Max (DB firewall) pricing has two primary components: 1) the Linux server (appliance software) license where the policies and audit respository for one or more protected databases are stored and managed in the included IRI Chakra Max Manager application for Windows, and 2) a supplemental license fee for each protected DB instance. Refer to the licensing information in each product section on this site for price ranges. Contact your IRI representative for more information and an NDA-confidential quotation for the use of any IRI software product, or for an IRI Professional Services engagement estimate. It may be included in your license fee in the first year, and then become an annual option at a percentage of the license fee that reflects the desired level of support and upgrades. For example, annual support at U.S. sites can be renewed for as little as 15% of the license fee basis for the hardware for direct US customers only. This level entitles you to minor updates and license transfer credits, and a 90% discount on major new releases. At the more common 20% level, major new releases are included, as is first (local) and second (IRI) level support. All levels include minor or intra-version updates, and credits for license transfers and lifts. If support at either level lapses, a major new release in later years can be licensed to existing users at 50% of its then current license fee, which includes another of support. 24/7 support is an additional premium that only some sites request or require. What does perpetual use mean? The software does not expire. IRI's default business model allows you to keep running forever, with or without support. So, you do not have to pay us all over again at the end of some multi-year term, unless you have specifically requested and are paying us to lease instead. Do you provide an SDK or IDE? The CoSort package comes with all the tools, conversion utilities, and callable libraries, as well as full .pdf documentation for the executables and APIs. How can I tune large job performance on my customers' disparate platforms whose specifications are unknown? When a CoSort package is installed, default system tuning parameters are automatically configured to exploit available RAM and CPU resources. Users can manually adjust their tuning parameters (including the assignment of sort overflow disks, and audit logs) in a simple text file. Usually through system-specific license keys. Call us to describe your situation. How long will it take to integrate CoSort? That depends on what component(s) you choose to apply, and the extent of functionality you need. For a basic sort, it may take as long to choose an interface as to implement one. Implementing custom user input, compare, or output routines, or write custom, field-level transforms (i.e. adding your own cleansing or statistical functions for individual fields) will take longer. How much are CoSort royalties? From USD$150 to $15K per copy, or site, when embedded and redistributed within your application. It depends on what piece you integrate, how many and how quickly you distribute them, plus the (average) size of end-user hardware and cost of your application. We aim for fair licensing within your business model. Is CoSort tuning only global, user, or job specific? Actually, it can be any (combination) of the above. • Third-Party Sort PlugIns: e.g., Unix sort, SAS, etc. What kind of performance (improvement) can I expect? That depends on your current methodology, hardware, kernel and CoSort tuning, data volume, and job specs. You can measure it during a free, confidential trial. Will I pay for a development copy? How much? If so, less than you would for production. Call IRI to discuss your situation. A master data component that affects many applications and transactions is missing, or wrongly, inconsistent, or labeled differently. How do I cleanse this data? IRI Voracity's new Data Unification wizard follows the consolidation style of MDM, and allows you to compare, reconcile, and bucket new master values using fuzzy matching logic. Alternatively, you can manually move the master data to a central place and metadata repository where it is easier to clean, manage risk, and support a SOA chain. Define the files and fields in the CoSort SortCL tool readable format and scan for naming and attribute discrepancies. Create SortCL jobs to integrate and standardize these files, and leverage custom, field-level transformation functions to cleanse the data according to your own business rules. Once prepared in the file system via rapid CoSort SortCL operations, you can then re-populate master data tables as needed. SortCL join operations can also filter and report on changed master data that are in files. As we move to a centralized MDM model, all our critical metadata may sit in one vulnerable basket. Our trusted internal systems and processes touch this data. But we also need to make it available to outsourcers and for testing. What can we do to balance need-to-know and access/user requirements? CoSort's SortCL tool can apply the necessary security filters to help you enforce your need-to-know rules, and to encrypt and anonymize specific file data at risk before it is exposed. You must mask your master data at the field level if you need to test or outsource this data -- or provide views to different departments -- and leave less-sensitive data still accessible. How can we log and trace these corrective and protective procedures conducted in this tool? All CoSort (SortCL) application scripts (whether for data transformation, reporting, protection or prototyping) are parsed and saved with runtime information in audit logs that you can secure and query with your preferred XML application or SortCL itself. Product data is often in hierarchical format, while customer data must be represented relationally. How can this tool assist? The SortCL program in IRI CoSort can flatten and process some hierarchical data, including mainframe index files, to prepare for DB loads and business intelligence tools. SortCL can also join product data with customer transactions (as well as other files with common keys) and output custom reports. These reports can include aggregation and cross-calculation of the detail and summary data produced. SortCL can also perform field-level lookups to find discrete values, and populate newly formatted files. RowGen v3 pricing starts well below $10K for perpetual use, and increases proportionally with additional CPU cores that you may wish to exploit. Maintenance is free in the first year and then 15- 20% of your license fee, depending on the level of upgrades. What does RowGen do besides 'generate rows'? Can CoSort's SortCL tool sort, join, and report on XML files? Yes, as long as your XML files describe structured, sequential records. The output can be another flat XML file, or any another file type that SortCL supports. Can I convert XML to other file formats? Yes, if the XML file contains structured, sequential records, and the output process type is documented in SortCL. Can I create XML files from other file formats? Yes, if those other process types are documented in SortCL. Any valid output targets can also be custom-formatted and protected for reporting, hand-offs, and outsourcing. Can I mix XML with other inputs and outputs to integrate and stage this data in an ETL environment, for example? Yes, subject to the format limitations defined above. Is there a limit to XML file sizes that I can process? No, unless you run out of disk space. Are there any limits to the type of transform I can use? At the field-level, you cannot link custom transformations that require file-level information, such as statistics. However, SortCL already supports file and record-level aggregation, plus cross-calculation, for detail and summary reporting. SortCL sends the field data to the routine, which then sends it back in the transformed state, formatted per the other attributes in the output field description. How would I specify my own transform or vendor library? Write or license a library and specify it at the top of a SortCL job script (which can also be invoked in a thread-safe API call). In the /INREC or /OUTFILE phase of the script, define the library as a field attribute.